Metal roofs are becoming more common among business owners, particularly in the real estate, medical, insurance and other industries. While many in Atlanta and surrounding areas prefer a metal roof over shingles or other roofing materials, this type of roof system can present its own set of problems. A metal roof is a great choice when you want a roof that is energy efficient, durable, and has a long lifespan. We’ve included some of the most common issues with this type of roofing system and how you can prevent them below. Leaks can occur with any type of roofing system. If you have a metal commercial roof, leaks may result due to inadequate flashings, incorrect placement of fasteners, or use of sealants that aren’t of the best quality. When having a professional inspect the roof be sure these factors are considered in determining the source of the leak. If your commercial roof has a wavy appearance, it is likely due to elastic buckling or “oil canning,” a problem that occurs when a metal panel cannot remain flat due to excessive stress. In these situations it’s often helpful to have a thicker metal installed, one that can retain its flatness. 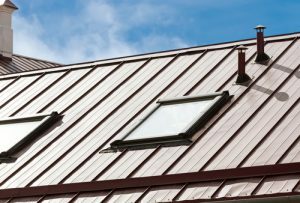 Even though special coatings are used on metal roofs to reduce the impact of water exposure, corrosion can still be a problem over the long term. You may notice rust or other corrosion, and while rust can usually be removed it may be a bigger problem when the area that’s rusted or corroded is extremely large. Our Atlanta commercial roofing experts will closely inspect the roof to determine the best path forward. Regardless of the roofing system used in commercial and industrial applications it’s always recommended to have your roof inspected by professionals on a regular basis. Early detection of potential problems is key to resolving the issues before they cause more damage to your property or become huge problems that could cost you a small fortune in repair or replacement costs. At Kelco Roofing we are the experts in commercial roof inspection, installation and repair for companies in the Atlanta area. Give us a call today!